ARIPO national phase patents may be filed up to 31 months from the priority date of the patent application. The ARIPO patent filing fee is from US$2,735, together with a US$680 first year maintenance fee (presuming all countries are selected). See our ARIPO patent costing tool. Botswana, Gambia, Ghana, Kenya, Lesotho, Liberia, Malawi, Mozambique, Namibia, Rwanda, Sierra Leone, Sudan, Swaziland, Tanzania, Uganda, Zambia and Zimbabwe. a certified copy of the priority document. ARIPO patents are subject to substantive examination. And, once granted the ARIPO patent results in a national phase patent in each of the countries selected, which remains in force for 20 years (with annual maintenance fees). ARIPO does not require marking or use, leaving this to the national laws of the selected countries. Enforcement of an ARIPO patent is also regulated by the national laws of the selected country. ARIPO recognizes: (i) Goods marks; and (ii) Service marks (with the exception of Malawi). 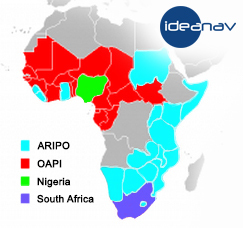 Botswana, Lesotho, Liberia and Swaziland permit a single ARIPO trademark to be filed in respect of multiple classes. However, Malawi, Namibia, Tanzania, Uganda and Zimbabwe only permit an ARIPO trademark to cite a single class – divisional trademark applications are required to cover the additional classes. Botswana, Lesotho, Liberia, Malawi, Namibia, Swaziland, Tanzania, Uganda and Zimbabwe. ARIPO trademarks remain in force for periods of 10 years, renewable indefinitely. ARIPO does not require marking or use, leaving this to the national laws of the selected countries. Enforcement of an ARIPO trademark is also regulated by the national laws of the selected country. ARIPO design law requires “relative novelty”. As such, even if prior disclosure has occurred, it may still be possible to file an ARIPO design. An ARIPO design may include only one embodiment. However, it may cite multiple classes. See our ARIPO design costing tool for a good indication of ARIPO design costs. Once granted, the ARIPO design will remain in force for 10 years (with annual maintenance fees). ARIPO does not require marking or use, leaving this to the national laws of the selected countries. Enforcement of an ARIPO design is also regulated by the national laws of the selected country.